hen Steve Jobs was alive it was tempting to draw analogies between Apple and a religious cult. Product launches in the Moscone centre in San Francisco seemed more like evangelist congregations than capitalist rituals. And in the days before the revered new products actually appeared in the cult’s retail outlets, excited worshippers could be seen camping out in surrounding streets. I remember once being in a British shopping arcade on the day that the local Apple Store opened for the first time. Long queues had formed from the moment the arcade gates had been unlocked that morning. Then came the magic moment: the glass doors opened, a hush fell on the assembled crowd, a group of T-shirted staff walked out, formed a human avenue leading into the store and then clapped rhythmically as the mob surged in. It was a truly extraordinary moment in which the conventional marketing mantra about the customer being king was turned on its head. In the case of Apple, it seemed, the customers felt privileged to be allowed to enter the store. At the time, I concluded that much of this Apple worship could be put down to the astonishingly charismatic personality of Jobs. He was, after all, the only chief executive in the history of the world to be accorded the kind of adulation normally granted to rock stars and messiahs. Apple was obviously a one-man band and he was the Man. It seemed reasonable to conclude when he died, therefore, that the cult of Apple would diminish or at any rate that its share price would have peaked. How wrong can you be? Jobs has been succeeded by Tim Cook, a nice man for whom the phrase “charisma deficit” might have been invented. But the cult of Apple is still going strong – witness Stephen Fry’s oleaginous piece in the Telegraph the other day, which was based on a recent trip he made to Apple headquarters at No 1 Infinite Loop, Cupertino (described by Fry as “the coolest address in the universe”). And as for the share price, instead of declining gracefully it continues to rocket. As I write, Apple’s stock market valuation is $746.7bn (£489.1bn) which makes it the most valuable company in the world and one that is set, according to Fry, to become “the world’s first trillion-dollar company”. When Jobs was in his pomp, we used to say that he was surrounded by a “reality distortion field” that made it impossible to have an objective view of him. No such field surrounds Mr Cook, but it certainly seems to envelop his company. At any rate, people have come to believe that, as far as Apple is concerned, anything is possible. Hence the fevered speculation that its next target is the car industry. All kinds of portents – from straws in the wind to chicken entrails and recent corporate hirings – are leading people to conclude that Apple must be working on a car. I call it an iCar but the codename for the project is apparently “titan”. Classicists (and readers of Wikipedia) will immediately recall that the titans were giant Greek deities of incredible strength. 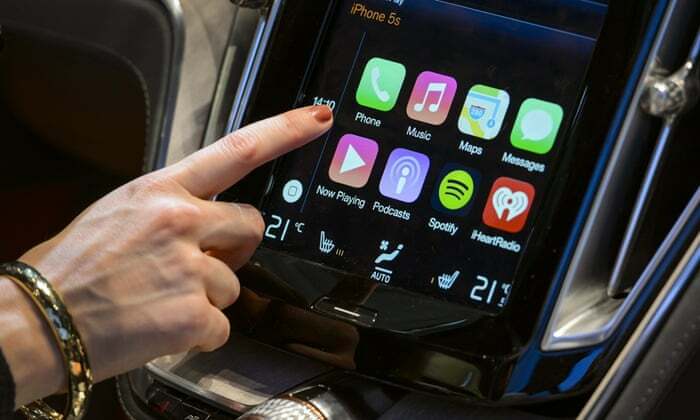 This implies that the iCar will not be just a mobile iPhone docking station, but something more substantial – hardware powered by an electric motor or two, perhaps. There must be something in the water in Silicon Valley (assuming they still have water) which leads geeks to become obsessed with the car industry. There’s Google with its self-driving car (which in its first manifestation is likely to be more like a self-driving golf cart) and Elon Musk’s Tesla company producing electric cars for millionaires who do not suffer from a new condition known as “range anxiety”. And now there’s Tim Cook’s Apple apparently trying to get in on the act. Why this obsession with cars? There are only two possible explanations. One is the kind of lunacy that is brought on by smoking your own exhaust: the car industry, despite the blatherings of Jeremy Clarkson, is a tiresome, low-rent, low-margin, grisly business. The other possible motivation is at least rational, based on a strategic view that the information technology industry will eventually peak and that it makes sense to have a beach-head in industries such as healthcare and transportation, for which there will always be stable consumer demand. If this is indeed what is driving project titan, then maybe it’s time to consider whether those Apple shares of yours might be approaching their peak. As the ancient Greeks knew, those whom the gods wish to destroy, they first make mad.